The FLOATING PLATFORM is a modular construction, which is intended to function as a buoyant foundation for N55 SPACEFRAME (see manual for N55 SPACEFRAME), or for other lightweight constructions. 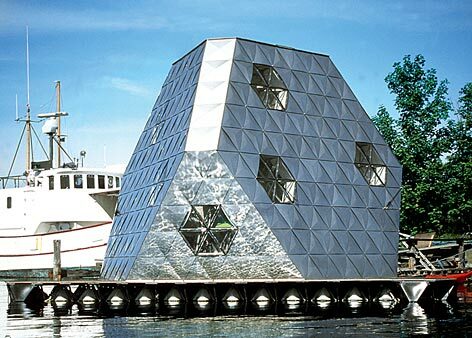 It can also be used for other purposes, for example building land The FLOATING PLATFORM is a space lattice, comprised of small modules made from stainless steel with built-in buoyant tanks. The small modules in the platform can all be assembled by hand. The modular system facilitates gradual extensions and makes the platform less vulnerable to damage; for example, leaks only have local impact and can be repaired locally. The platform draws approximately 1.2 meters when loaded. Floating systems that lie still in the water most of the time have other requirements than ships and barges that have to be stable during navigation. For example, stability can be obtained without ballasting, thereby reducing the use of materials. In addition, construction methods that normally are not used on water can be applied. The floating system can also be shaped according to the intended usage. The FLOATING PLATFORM has comparatively low net buoyancy. This is an economic advantage, but limits the amount of weight that can be added to the platform. However, the modularity of the platform offers the possibility to add more buoyancy when there is a need for it: extra tanks may be connected to the sides of the platform, material may be put into the cavities in the steel truss or extensions can be made from the same building system. Tanks for water and wastewater, toilets etc. can be integrated in ways that do not add load to the construction. 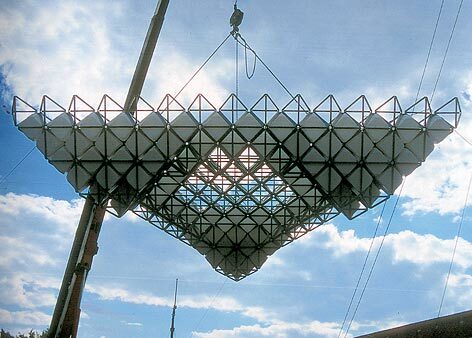 The platform is constructed as an "octet truss" space lattice (see Manual for N55 SPACEFRAME) and is shaped as an equilateral triangle. 189 polyethylene tanks make the platform buoyant. They are concentrated in the three pontoons situated in each corner of the platform. 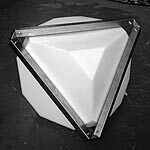 The pontoons are constructed from 3 layers of tanks and are shaped as tetrahedra with one vertex pointing downwards and a plane facing upwards. Buoyancy: The tanks are made from low-density polyethylene. 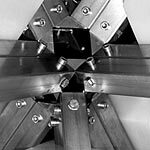 They are built into tetrahedra of stainless, acid-resistant steel, which are assembled into a coherent "octet truss" space lattice. The buoyancy of the tanks is reduced at low temperatures because they are made of flexible material (there is an approximated 10% difference between 0° and 20° C). Due to the stronger buoyancy in the pontoons, leverage creates a strain towards the centre. This is compensated for by reinforcing the platform with a sidepiece consisting of an extra layer of struts The cavities between the tanks in the steel truss create turbulence, and thus the effect of the waves is reduced when they meet the platform. The triangular shape also adds stability as the platform floats on three "points". Boards are attached to the steel truss and plates of birch plywood are fastened on top of them. The plywood functions both as a deck and a floor. 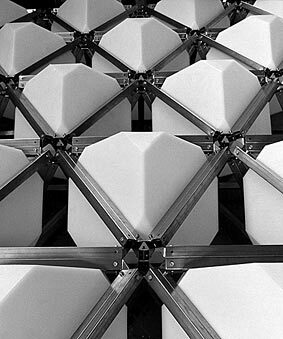 It also contributes to the stabilisation of the lattice construction. The top construction is fixed directly onto the wood as well as with bolts through the wood to the platform. The space lattice in the platform is constructed from a steel type that is the most durable in brackish water, on the condition that plants and algae will grow on it. However, galvanic currents will cause sporadic corrosion on the steel unless measures are taken. Zinc blocs are attached to the steel with a distance of 1 meter maximum. Zinc is a more reactive metal than stainless steel and will therefore provide sacrificial protection. Using this method, one should be able to avoid any corrosion of the steel. The construction as a whole is stable and safe in heavy weather and wind up to the strength of a hurricane, provided that it is well moored. The maximum load on the large sides is 3000 kg horizontally and 300 kg vertically in a wind of 33 m/s (i.e. hurricane conditions). To secure the construction under these conditions, it should be moored from each corner with a strength of 3.3 tons and an angle of 12°. There are mooring chains fixed around 2 of the node points in each corner of the platform. Two bruce-anchors hold one of the corners and the other two are moored to bollards on land. The tanks are concentrated in the corners of the platform. Neither the steel nor the tanks are treated: they need no other maintenance than regular checking. The construction can be lifted up in order to check thoroughly for corrosion and leaks. The zinc blocs must be exchanged when the zinc is gone. The plywood deck must be checked regularly for damage, and the damp seal on the edges must be maintained. Assembling the FLOATING PLATFORM at FACTORY. Boards of birch plywood are fixed with bolts to the node points of the construction. The boards are treated against dampness with epoxy and light primer. Dimensions: Sides 8.4 m, area approx. 40 m�, height: 1.5 m.
Buoyancy in platform: 7500 kg. Total weight of the construction: 5500 kg. Tanks: buoyancy / tank at 20°C: 44.8 l. At 0°C: 41.3 l.
1100 kg welded square tubes in stainless steel AISI 304, 30 x 30 x 1,20 mm, cut in lengths 48.6 cm, each 8 holes Ø 6 mm. Stainless steel AISI 304, stainless hexagonal bolts M6 x 12, stainless setscrew M6 x 70, stainless lock nut M6. Stainless discs 18/6.4 x 1.6, stainless Pozidriv screws 5.5 x 38 mm.